Need a break? Let's relax with a soothing cup of robo-tea! A cute, queer visual novel awaits you. 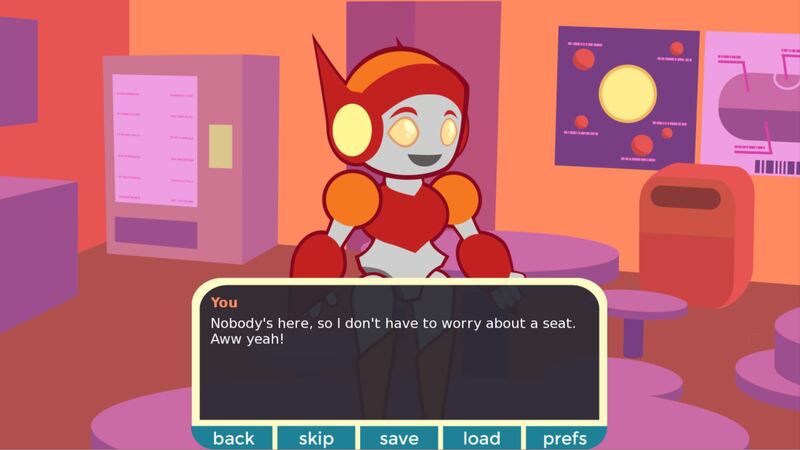 Let your worries disappear in a place where you meet some lovely bots! a secret note hidden in the main/title screen! "Thank you Robohaven for introducing me to my conjunx endura"
"ROBOGAME HAS KILLED ME I AM DEAD"
"[I keep] having to pause this goddamn game because I CA NT HANDLE IT I CANT HANDLE THIS CUTE GAME FIUC KING Robohaven HOW D A R E YOU"
"this stinking game...I am not even that far in and I have laughed and smiled more genuinely than I have all week. Bless you." "REVEK IS A GODDAMN CASANOVA AND NOT HAVING GAY FEELINGS ABOUT THEM IS IMPOSSIBLE"
The best thing I've seen is people live-tweeting their ultra-gay feelings while playing the date routes. as you can see in the "reviewers" section! please use #roboteagame or #robotea on twitter if you do! Yes, you may LetsPlay/Stream! It has now been well over a year since robo-tea:1cup! was released and completed. Please enjoy this game with your friends all over the world! Please, please add proper closed captioning for your videos, so everyone can enjoy watching your video! Thank you so much for making videos of the robo-tea games! I have been too flustered to finish watching the full videos (I get embarrassed about hearing my writing ahh) but what I've seen and heard has been great! ;w; I'm happy you've enjoyed the series, and I hope to get the 2nd serving done soon! Thank you for playing!!! I'm glad that sweetness and adorableness has shone through! aaaaaaaaaaaaa thank you so much for playing robo-tea1 and commenting!!! I hope you don't get diabetes, and that you get to enjoy all the other games too! i'm melting. . this is so fluff. . i can't,, i love them both. aaaaa! I'm so glad you love them both! I want to kiss Revek. Hehe, Revek's been considered the "most kissable robot." Maybe someday I'll make a scene where you can kiss them! Oh my goodness, thank you very much!! *w* I'm glad you found it and hope you enjoy the next stories in this world, too! This was the cutest and most entertaining game! The robot worlds were all interesting and well thought out, and the characters were completely adorable. I love the detail put into their hobbies and the places they visited. I can't wait for the next cup! Thank you so much, Aura!! This means a lot to me, to know that you enjoyed the first serving of robo-tea.